We can all agree puppies are wonderful, but there’s nothing quite like the sweet soul of an old dog. As your canine companion enters their golden years, it may seem like more of a challenge to keep them comfortable. But when you understand what’s happening in the body and mind of your senior dog, just a few shifts on your part can make a world of difference in keeping them as happy and healthy as possible. 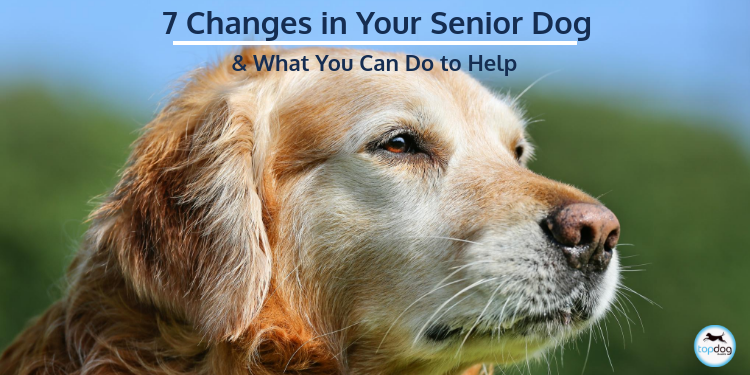 Here are the 7 main changes you can expect to see in your senior dog, and how you can help ease their transition. Getting stiffer in their golden years is part of the aging package for almost every senior dog. By the time a dog reaches 8 years of age, they have an 80% chance of having arthritis. This can mean more difficulty getting up, climbing stairs or jumping onto beds, and even simply walking around. Realizing that your beloved dog may be arthritic can seem daunting, but there are so many quick and easy things that can lessen your pup’s discomfort. Giving a high-quality joint supplement just once a day can be tremendously helpful, and gentle stretches can help increase mobility. Plus, try these 3 ways to show your dog’s joint some love in 5 minutes or less. Just like humans, senior dogs can start to show gray hair, especially around their eyes and muzzle. Their coat may also become thinner and duller. While this can be a normal part of the aging process, it could also be a sign of nutritional deficiency. Giving your dog a fatty acid supplement can help restore some of the shine and luster to your older dog’s coat. They will also benefit from more combing and grooming, and will love the extra attention. If you notice extreme changes to their coat, be sure to see your veterinarian. Dental disease is unfortunately fairly common in older dogs. If not routinely removed, plaque can build up on the teeth to form tartar, which irritates the gums, leading to inflammation called gingivitis. If the tartar is still not removed, the damage can lead to irreversible periodontal disease, which can cause loose teeth, abscesses, and bone loss or infection. Prevention is key when it comes to keeping your older dog’s teeth and gums healthy. A good dental routine consists of daily tooth brushing, regular visits to your veterinarian (which include an oral exam), and professional dental cleaning as advised. Hearing loss can be hard to spot in your senior dog, and oftentimes pet parents don’t realize their dog is hard of hearing till the process is in the advanced stages. Has your once-responsive pup been “ignoring” you? Do they spook easier, or have they become more difficult to wake? Consider the fact they may be hard or hearing. The first step if you suspect your dog has hearing loss is to take them to the veterinarian for further investigation. They will often give you instructions for how to be diligent about ear care and cleaning, which if neglected can make matters worse. If spotted early and your dog still has some hearing ability, you can start pairing commands with hand signals which can still be understood even when hearing is lost completely. It’s also helpful to be more obvious, taking care not to accidently sneak up behind your dog and always approaching in their line of vision. Does your once-championship ball retriever have a harder time catching it on the fly, or finding it on the ground? Like hearing loss, impaired vision is often a gradual process that can be easier for your pup to transition into if you catch it early. Again, it’s a good idea to take your senior dog to the veterinarian to get their senses checked if you suspect vision loss. Your next step is to put their safety first by eliminating any dangers in your home, such as placing a baby gate at the top of the stairs. You can also help them get their bearings with sound cues, such as purchasing a bubbling water bowl so they can find it more easily, or placing bells on your shoes to let them know where you are. Every senior dog should have check-ups at the veterinarian at least twice a year, even if they seem healthy. Just like humans, older dogs are more at risk for certain health issues, which are always easier to deal with when caught early. You are your pet’s best advocate, and this is especially true at the veterinarian’s office. Check out our tips for how to make the most of your pet’s vet visit. When your dog was a puppy, everything was new, exciting, and couldn’t be explored fast enough. Senior dogs have learned more about the world, and are more content to slow down and take it easy. Understand that just because senior dogs may not be acting overly excited, doesn’t mean they aren’t enjoying themselves. While your dog as a puppy may have strained at the leash on their daily walks, they may now be perfectly content to have a slow, quiet stroll down the block with you, their favorite person. The final thing you can expect of your senior dog is deep gratitude for your companionship. While they may need a little more loving care as they age, an older dog has had time to become well versed in the fine art of friendship. They want nothing more than to give you their unconditional love.